The release of You Are Here Ornament – Bulgaria tells me, that I underestimated the amount of minis coming out this year. Not only bigger markets like Germany are getting new releases, we’re seeing Slovakia, Romania and Bulgaria joining the party as well. We can only wish that all European mugs are “minimized”, but it’s up to Starbucks marketing department to decide. 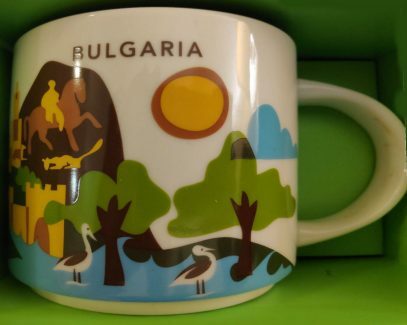 This Icon mug came from Sofia, Bulgaria. Red is used as its theme color. Ivan Vazov National Theatre can be seen on the front of the mug and Orlow Bridge on the back. 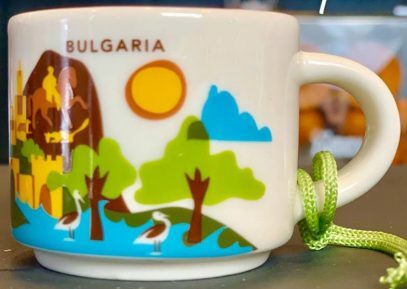 This Icon mug came from Bulgaria. Dark Brown is used as its theme color. Damask Rose can be seen on the front of the mug and Oslekov house, Koprivshtitsa on the back.